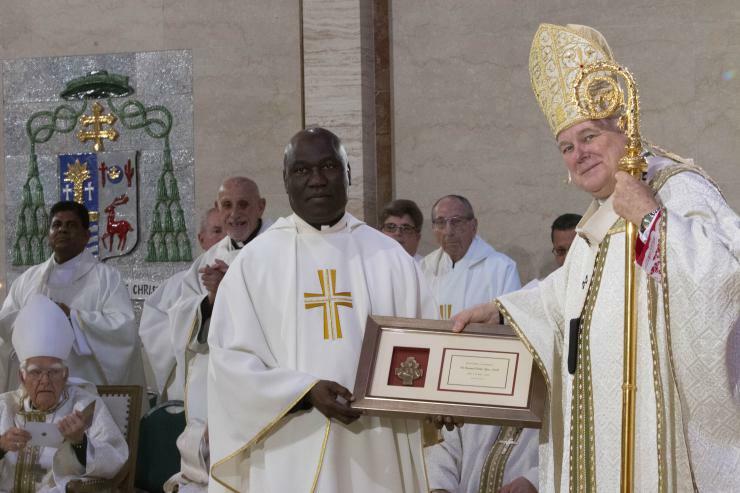 Varied group includes natives of Spain, Nicaragua, Nigeria, India, Colombia, Haiti and U.S.
Father George Packuvettithara, celebrating 25 years, receives his commemorative plaque from Archbishop Thomas Wenski. He is pastor of St. Rose of Lima, Miami Shores. Father Michael Grady, celebrating 25 years, receives his commemorative plaque from Archbishop Thomas Wenski. He is pastor of St. Anthony, Fort Lauderdale. Father Francisco Hernandez, celebrating 25 years, receives his commemorative plaque from Archbishop Thomas Wenski. He is pastor of St. Raymond, Miami. 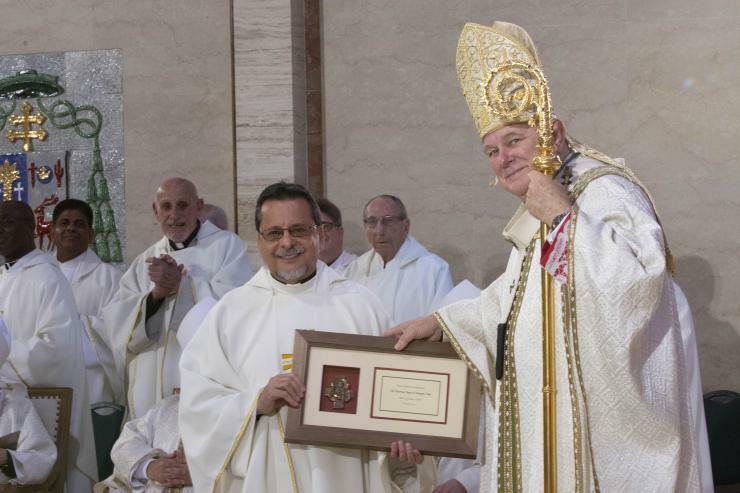 Father Jorge Carvajal-Niño, celebrating 25 years, receives his commemorative plaque from Archbishop Thomas Wenski. He is administrator of Mother of Christ, Miami. Montfortian Father Esteker Elyse, celebrating 25 years, receives his commemorative plaque from Archbishop Thomas Wenski. He is parochial vicar at St. Bartholomew, Miramar. 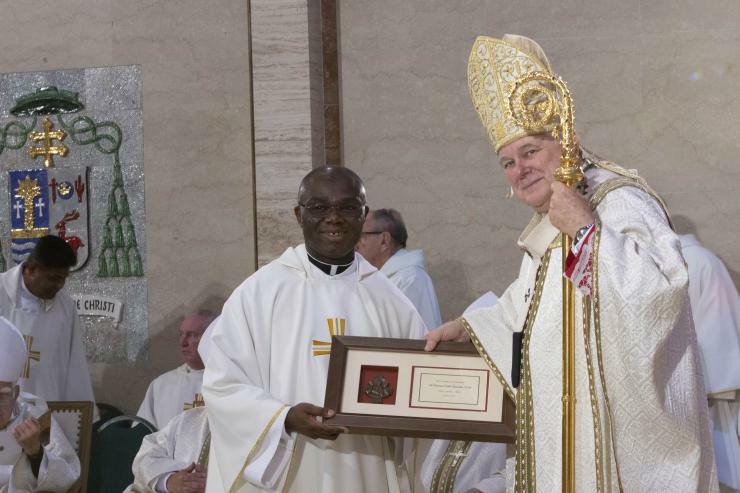 Holy Spirit Father Fidelis Nwanko, celebrating 25 years, receives his commemorative plaque from Archbishop Thomas Wenski. He is administrator of St. Philip Neri, Miami Gardens. Father Roger Holoubek, celebrating 50 years, receives his commemorative plaque from Archbishop Thomas Wenski. Now retired, his last assignment was as pastor of St. Maurice at Resurrection, Dania Beach. 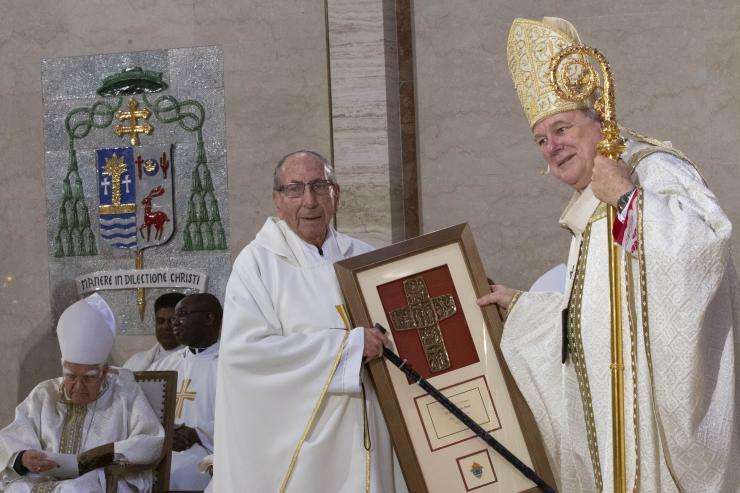 Father Julio Estada, celebrating 60 years, receives his commemorative plaque from Archbishop Thomas Wenski. Now retired, he helps out at St. Matthew, Hallandale. 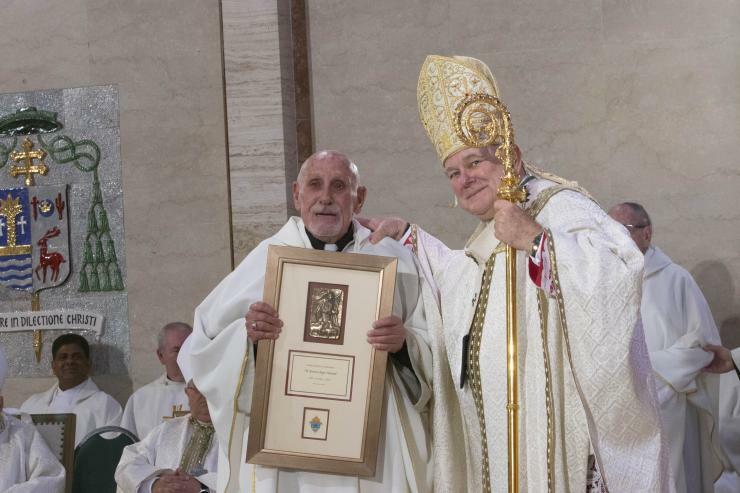 Father Emilio Salerno, celebrating 60 years, receives his commemorative plaque from Archbishop Thomas Wenski. Now retired, he helps out at All Saints in Sunrise and St. Elizabeth Ann Seton, Coral Springs. Priests marking their jubilees of ordination pose with Archbishop Thomas Wenski outside St. Mary Cathedral after the Mass. 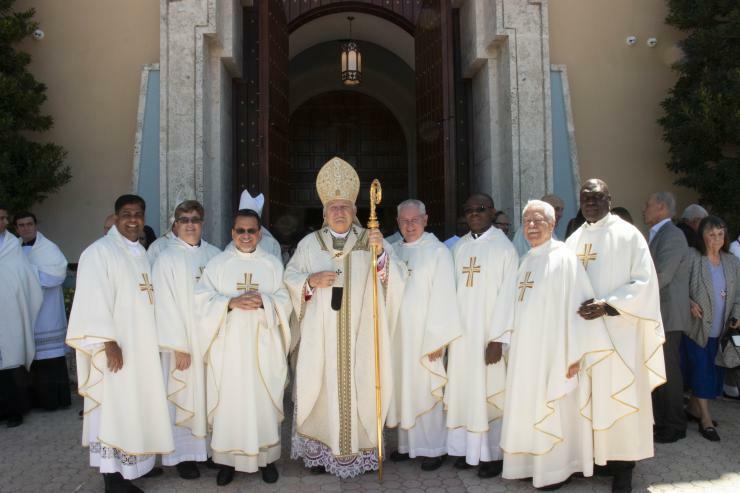 From left: Father George Packuvettithara, Father Francisco Hernandez, Father Jorge Carvajal-Niño, the archbishop, Father Michael Grady, Holy Spirit Father Fidelis Nwanko, Father Emilio Salerno and Montfortian Father Esteker Elyse. 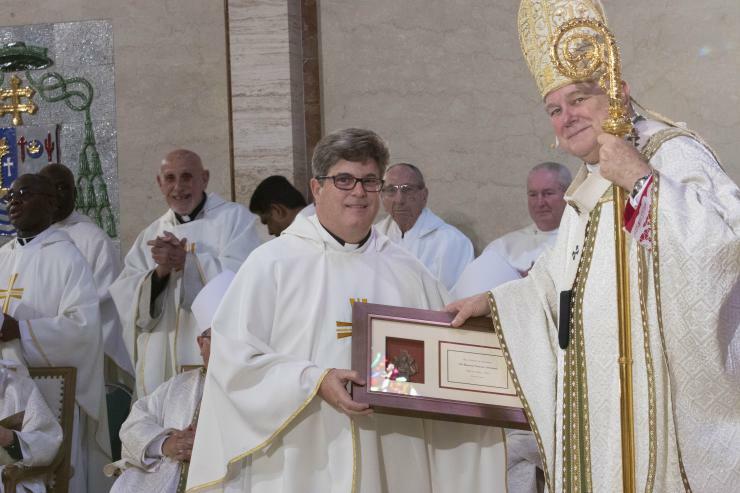 MIAMI | The following priests, who are celebrating 60, 50 and 25 years of ordination, were honored by Archbishop Thomas Wenski and fellow priests during the annual Chrism Mass, celebrated at St. Mary Cathedral April 16, the Tuesday of Holy Week. The Mass takes its name from the oil of chrism - used in confirmations and ordinations - which is blessed by the local bishop during the Mass, along with the oil of catechumens, used in baptisms, and the oil used for the anointing of the sick. These oils will then be taken back to the parishes and used throughout the coming year. During the Mass, all priests also renew their priestly vows. The Chrism Mass was livestreamed on the archdiocesan Facebook page @ArchdioceseofMiami, and a photo album was posted on the archdiocesan website alongside the archbishop's homily that day. Here are brief biographies of the jubilarians. Father Julio Estada, marking 60 years of ordination. Father Estada, born Aug. 28, 1932 in Madrid, Spain, studied at the Madrid Diocesan Seminary and was ordained May 17, 1959, for the Archdiocese of Madrid-Alcalá. He joined OCSHA (Obra de Cooperación Sacerdotal Hispano-Americana), through which Spanish priests were sent as missionaries to Latin America, and worked in Colombia from 1959 to 1980. 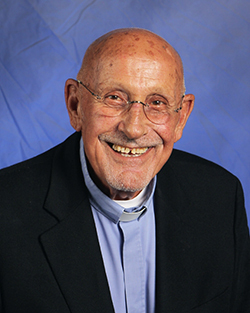 He taught at the collegiate and university levels and served as a hospital chaplain, in urban and rural parishes, and as pastor of San Lorenzo in Bogotá from 1971 to 1980. 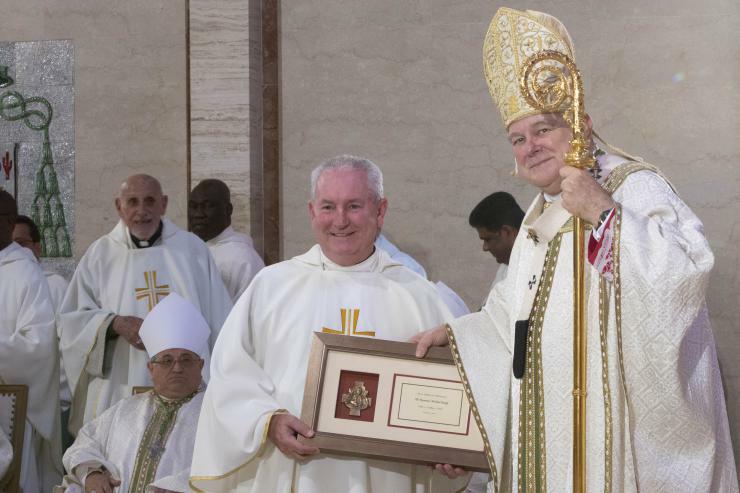 In 1980, he came to South Florida and served as associate pastor of St. Benedict Church in Hialeah until his retirement from fulltime ministry. He currently helps at St. Matthew Church, Hallandale Beach, and Mercy Hospital, Miami. 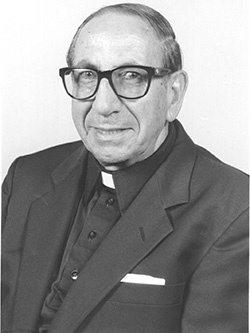 Father Salerno was born Dec. 27, 1933 in New York, and ordained May 30, 1959 for the Diocese of Brooklyn, where he served until his retirement. He came to South Florida in 2005 and has helped at All Saints Parish in Sunrise and St. Elizabeth Ann Seton in Coral Springs. 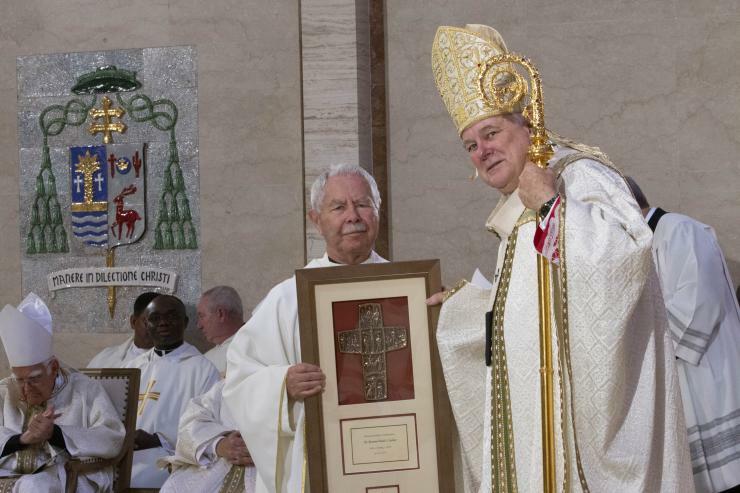 Dominican Father Gerard Austin, marking 60 years of ordination. Born Nov. 2, 1932, Father Austin was ordained June 5, 1959, for the Southern Province of the Dominican Order. He is a scholar, teacher and author specializing in liturgical sources, sacraments, ecclesiology and ministry. 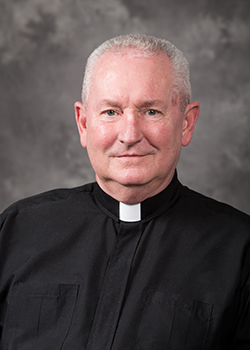 He taught at The Catholic University of America from 1968 to 1999 and at the Blessed Edmund Rice School for Pastoral Ministry, in the Diocese of Venice, from 1999 to 2012. 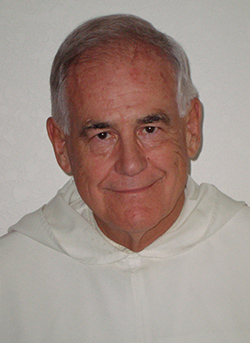 Since 2012, he has been Dominican Scholar in Residence at Barry University, Miami Shores. Father Roger Holoubek, marking 50 years of ordination. Father Holoubek was born May 10, 1943 in Butte, Montana. When he was four months old, his family moved to Clewiston, Florida. He attended local public schools, then studied one year at the University of Florida before entering St. John Vianney Seminary in Miami. He was a member of the second class to graduate from St. Vincent de Paul Seminary in Boynton Beach and was ordained to the priesthood May 24, 1969, for the Archdiocese of Miami. 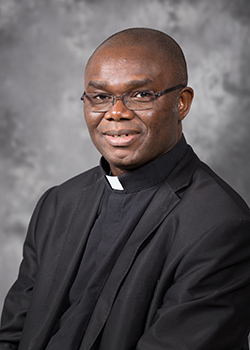 He has served at St. Juliana Church in West Palm Beach, as chaplain of the Civil Air Patrol in Palm Beach, as associate pastor at St. John the Baptist Church in Fort Lauderdale and St. Coleman Church in Pompano Beach, and as pastor at St. Lawrence Church in North Miami Beach. In 2000, he became pastor of St. Maurice Church, Dania Beach (now St. Maurice at Resurrection Parish), and also served as chaplain of the Hollywood Fire Department. He retired from active ministry in July 2016. 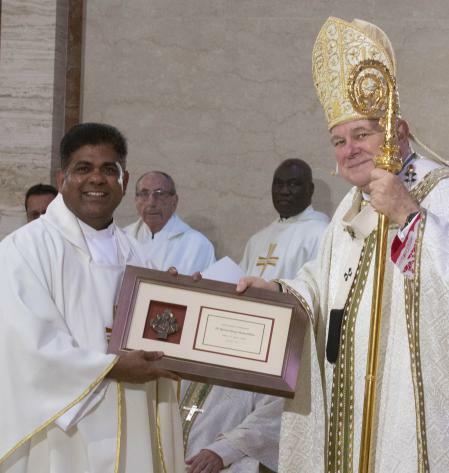 Father George Packuvettithara, marking 25 years of ordination. 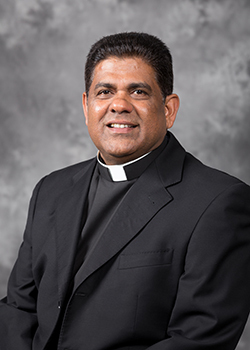 Father Packuvettithara was born in India and ordained there April 27, 1994. He arrived in the Archdiocese of Miami in August 2004 and was named parochial vicar at St. Joseph, Miami Beach, where he served until 2010. He then served as parochial vicar at St. Maximilian Kolbe, Pembroke Pines (2010-11), parochial vicar and temporary administrator at St. David, Davie (2011-14), parochial vicar at Nativity, Hollywood (2014-15) and administrator of San Pedro, Plantation Key (2015-16). In July 2016 he was named to his current assignment as pastor of St. Rose of Lima, Miami Shores. Father Michael Grady, marking 25 years of ordination. Father Grady was born Dec. 7, 1956 in Sacramento, California, the third of five brothers. His father served in the Air Force and the family moved often, eventually winding up in Rhode Island. He entered the seminary there right after high school and obtained a bachelor’s degree in political science and philosophy from Providence College, studied a year at the Catholic University of Louvain, Belgium, and nearly two years at the Catholic University of America in Washington, D.C., before leaving the seminary. He eventually worked his way up to director of marketing for a national hotel chain, a job that brought him to South Florida. In 1991 he entered the seminary again and was ordained for the Archdiocese of Miami May 14, 1994. 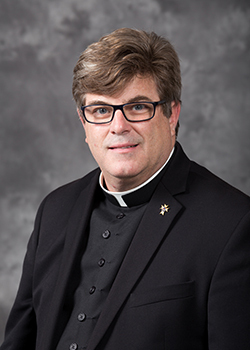 He has served as parochial vicar at St. Gregory Church, Plantation, and Nativity Church, Hollywood, as well as teacher and assistant principal at St. Thomas Aquinas High School in Fort Lauderdale, and chaplain and religion teacher at Msgr. Edward Pace High School in Miami Gardens. He also has helped at St. Mary Cathedral, Miami, St. Agnes, Key Biscayne, and St. Coleman, Pompano Beach. In 2011, he was named administrator and then pastor of St. Jerome, Fort Lauderdale, where he served until 2014, when he was named to his current assignment as pastor of St. Anthony Church, also in Fort Lauderdale. Father Francisco Hernandez, marking 25 years of ordination. Father Hernandez was born Dec. 22, 1966 in San Juan, Puerto Rico and considers himself a “Cuba-Rican” because he grew up on the island but his parents and grandparents are from Cuba. He studied in Passionist schools before entering the seminary in Miami in 1987. Ordained May 14, 1994, he served at Epiphany Church, South Miami (1994-97) and Sts. Peter and Paul, Miami (1997-2002), before becoming the first Hispanic pastor of the Basilica of St. Mary Star of the Sea, Key West. He served there from 2002 until 2006, when he was named pastor of Immaculate Conception, Hialeah. In 2014, he was named to his current assignment as pastor of St. Raymond, Miami. Father William Muñiz, marking 25 years of ordination. 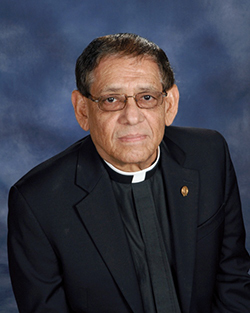 Father Muñiz was born in Nicaragua June 23, 1935, and originally ordained as an Episcopal priest. He worked for the Episcopal Diocese of the Rio Grande in New Mexico and Southwest Texas until coming to South Florida, where he was ordained for the Archdiocese of Miami May 28, 1994. He served as parochial vicar at Our Lady Queen of Martyrs, Fort Lauderdale, from 1994 until 2000. He also worked as director of outpatient services at St. Luke’s Addiction Recovery Center in Miami, chaplain at Holy Cross Hospital in Fort Lauderdale, and served in the Apostleship of the Sea (ministry to seafarers). From 2000 to 2006, he served as parochial vicar at St. Helen in Fort Lauderdale. 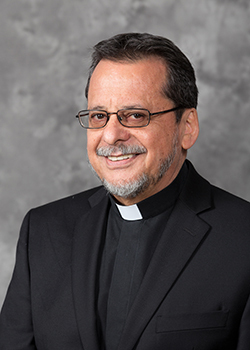 He retired from fulltime ministry in March 2012 but continues to help at St. Henry, Pompano Beach, where he celebrated the first Mass in Spanish in November 2015, officially starting a Hispanic ministry in the parish. Father Jorge Carvajal-Niño, marking 25 years of ordination. Born June 8, 1953, in Bogotá, Colombia, Father Carvajal-Niño was ordained June 29, 1994, for the Archdiocese of Medellín. Two years later he moved to the Archdiocese of Bogotá, where he served for 14 years as founding pastor of Santa María del Camino Parish. Sent to the Diocese of Dallas, Texas, in 2010, he served as parochial vicar of Santa Clara Church there until being named parochial vicar of St. Brendan Parish, Miami, in March 2015. In July 2017, he was named to his current position as administrator of Mother of Christ Church in Miami. Spiritan Father Fidelis Nwanko, marking 25 years of ordination. Father Nwanko was born July 21, 1967 in Nigeria and ordained there July 16, 1994, for the Congregation of the Holy Spirit (Spiritans). He came to the archdiocese in September 2006 and served at St. Henry in Pompano Beach (2006-07) and Holy Redeemer in Miami (2008-17) while also working as a chaplain at Jackson Memorial Hospital in Miami. Since April 2017 he has served as administrator of St. Philip Neri Church in Miami Gardens. Montfortian Father Esteker Elyse, marking 25 years of ordination. Father Elyse was born Jan. 16, 1956 in Jean-Rabel, Haiti, and ordained for the Montfortian Fathers July 16, 1994. 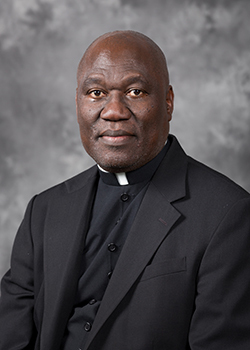 He arrived in Miami in July 2007 served at Notre Dame d’Haiti Mission, Miami, until being named parochial vicar at St. Mary Cathedral in November 2007. Since July 2015, he has served as parochial vicar at St. Bartholomew, Miramar. This article has been corrected since publication. Father William Muñiz now helps at St. Henry Parish in Pompano Beach. He used to be assigned at St. Helen in Fort Lauderdale. This article was updated after the chrism Mass, April 16, 2019.